"I may dare to speak, and I intend to speak and write what I think," wrote a New York volunteer serving in the Mexican War in 1848. Such sentiments of resistance and confrontation run throughout the literature produced by veteran Americans in the nineteenth century -- from prisoner-of-war narratives and memoirs to periodicals, adventure pamphlets, and novels. Military men and women were active participants in early American print culture, yet they struggled against civilian prejudice about their character, against shifting collective memories that removed military experience from the nation's self-definition, and against a variety of headwinds in the uneven development of antebellum print culture. In this new literary history of early American veterans, Benjamin Cooper reveals how soldiers and sailors from the Revolutionary War through the Civil War demanded, through their writing, that their value as American citizens and authors be recognized. 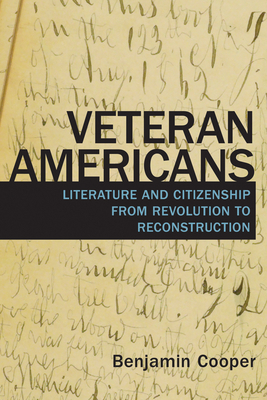 Relying on an archive of largely understudied veteran authors, Cooper situates their perspective against a civilian monopoly in defining American citizenship and literature that endures to this day. Benjamin Cooper is assistant professor of English at Lindenwood University.